:How many of us find ourselves constantly busy and, deep down, constantly soul-weary? By striving to keep up our busy pace, we can easily miss out on a deeper connection with God. So many of us are overwhelmed and underfed. But there is hope. 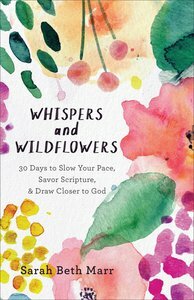 About "Whispers and Wildflowers: 30 Days to Slow Your Pace, Savor Scripture & Draw Closer to God"
Sarah Beth Marr danced professionally for over fifteen years as a ballerina and now encourages women in the dance of life and faith through her writing. Sarah also speaks at women's events and MOPS events in Texas. She is a contributing writer for Crosswalk.com, Christianparenting.org, and Lifeway's Journey Magazine. She and her husband, Brian, have three sons and live in Dallas, Texas. Learn more at www.sarahbethmarr.com.